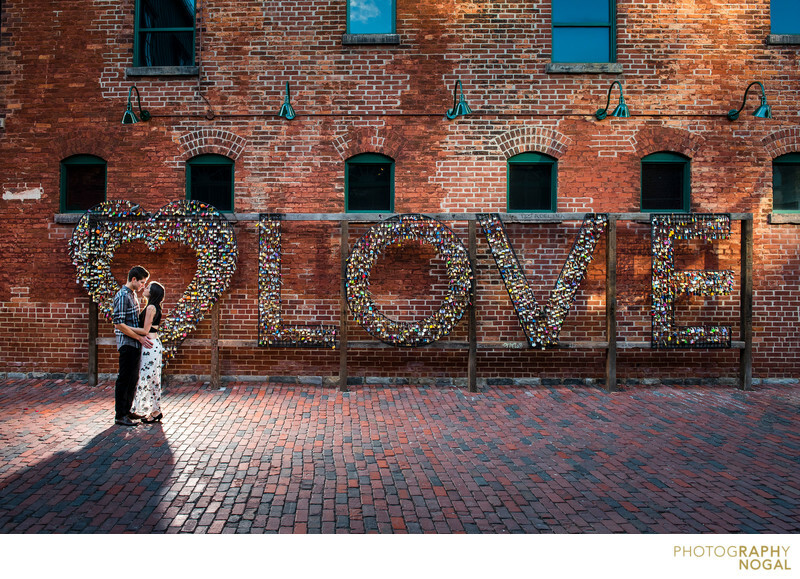 The Love Lock Wall at the Distillery District is quote popular and nest to impossible to get without anyone near it as people are always either adding locks to it or posing in front for some selfies. We patently waited until the coast was clear and politely asked some people just to hold off for a few seconds as we got a beautiful shot for our couple. This image was taken with the Nikon D750 at 1/320th shutter, aperture f5, ISO 640 with a 24-70mm f2.8 Nikkor Lens at 27mm focal length. Lighting was created by Profoto B2 placed behind the couple. Location: The Distillery District, Toronto, ON.